This chapter contains some offering information that will take place during the millennium. Remember, it's a Jewish period on earth - Sabbath keeping, sacrifices - all in memorial. Just as these practices in the Old Testament looked forward to the finished work of Christ, these will be a memorial of that which has already been done. Do you recall all of the offerings specified in the Mosaic Law (Leviticus 1-7, see notes)? Well...they're back! Here's more evidence demonstrating that the prince here serves under the Messiah and is not the Messiah, Jesus. Look at verses 16 and 18 with regard to the sons of the prince. Jesus, the Messiah, will not have sons. Also take note of the phrase in verse 18, "...the prince shall not take of the peoples inheritance by oppression..." No such admonition is necessary for the Messiah, Jesus. Obviously this is a reference to a leader who will serve under the Messiah. (Click here to see the summary on Ezekiel 44:1-14 regarding this issue.) So, let's make certain we are clear here. The "prince" of the millennium is a man and not the Messiah. He may have children and he does take part in making sacrifices. Ezekiel 34:24 And I the LORD will be their God, and my servant David a prince among them; I the LORD have spoken it. Ezekiel 37:25 And they shall dwell in the land that I have given unto Jacob my servant, wherein your fathers have dwelt; and they shall dwell therein, even they, and their children, and their childrens children for ever: and my servant David shall be their prince for ever. It is a difficult concept, but David is referenced as the prince in the millennium according to Ezekiel's prophecy. Based upon what we know to be the Messiah's part in the millennium, we can only conclude that David serves under the Messiah. Now let's look at it from another perspective for a moment. Did Ezekiel know that David was dead when he wrote this prophecy? Of course he knew; David had been dead for some 400 years or so. Did Ezekiel mean David or a descendant of David? On this one, I can only tell you what he said...David himself. Like all Believers, David will have a resurrected body. As a matter of fact, I'm convinced that he does already. Click here to read the article, "Paradise Relocated" for details on this issue. However, we don't usually assume that resurrected bodies have progenitors as is indicated in verse 16. On this one, I guess we'll all have to just wait to see for ourselves. It is clear from this chapter that the Sabbath and the observance of the new moon will be part of the worship ritual during the millennium. Here we are given some detail regarding the role of the "prince" in these observances. And here's another mention of sacrifices being made. As explained in the summary of chapter 43, these sacrifices will be reflective of the finished work of Christ on the cross. You will notice in that summary references to other prophets who also spoke of the resumption of sacrifices during that period. Here's the description of a river that originates from the temple and goes all the way east to the Dead Sea (verse 8). The Dead Sea won't be dead anymore; verse 8 goes on to say, "the waters shall be healed." That's because of the water supply that will then flow into it during the millennium, a river just beaming with life (verse 10). Then it'll be known as the "Living Sea" formerly known as the "Dead Sea"... I guess. One more thing...trees...healthy, thriving trees growing on the banks of this river - good for their fruit and even for medicinal purposes. And why is that you ask? Verse 12 says, "because their waters they issued out of the sanctuary." Joel also mentions this river in Joel 3:18 (see notes), "And it shall come to pass in that day, that the mountains shall drop down new wine, and the hills shall flow with milk, and all the rivers of Judah shall flow with waters, and a fountain shall come forth of the house of the LORD, and shall water the valley of Shittim." Zechariah 14:8 (see notes) says this about the river, "And it shall be in that day, that living waters shall go out from Jerusalem; half of them toward the former sea, and half of them toward the hinder sea: in summer and in winter shall it be." Zechariah points out that the river actually runs both east and west out of the temple. Toward the west, it empties into the Mediterranean Sea. It would appear that the water from this river adds longevity and health to life itself. Although this is not the same as the river found in Revelation 22, the similarity is worth noting. Revelation 22 speaks of the New Jerusalem, after the millennium, when there is no temple. But notice what is said in Revelation 22:1-2 (see notes), "And he shewed me a pure river of water of life, clear as crystal, proceeding out of the throne of God and of the Lamb. In the midst of the street of it, and on either side of the river, was there the tree of life, which bare twelve manner of fruits, and yielded her fruit every month: and the leaves of the tree were for the healing of the nations." So, it does seem as though this millennium river serves the same purpose as that which shall be located in the New Jerusalem...healing. You will notice that the land distribution is not the same as that in Joshua. Click here to see the map of the Tribes of Israel after the lottery in Joshua 19. According to this passage, the boundaries described extend from the vicinity of Damascus on the north, just below the Dead Sea on the south, the Mediterranean Sea on the west and the Jordan River on the east. The tribes will have land allocations that go from the east to the west all the way across the land. According to verse 48:1, Israel's millennium occupation will extend all the way up into Syria, 170 miles or so north of the Sea of Galilee. Notice the map to the right to see the general land assignments as specified in this passage. You will notice between the Tribes of Judah and Benjamin is located a tribal-sized area for the prince, temple, priests and other Levites. 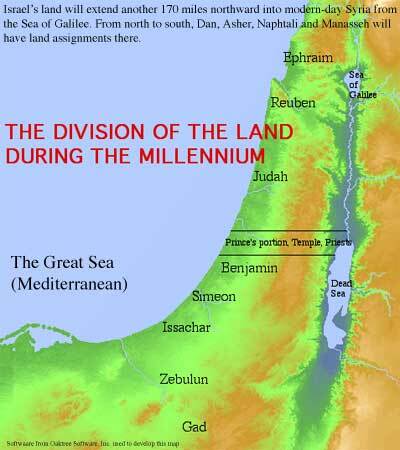 Verse 47:23 tells us that Gentiles in the millennium will receive a portion of land alongside Jews. While the tribal allocations are specified, the land within the tribal allotments will be divided by lot, just as it was in Joshua 19 (verse 47:22). You will notice another commendation for Zadok in verse 11. Only his descendants are charged with the priesthood. The other Levites will do temple maintenance. This isn't actually unique to the millennium; the prophetic decree was originally issued back in I Samuel 2:27-36 (see notes) when Eli's boy's were killed by God. We don't see its implementation until Solomon becomes king in I Kings 2:27, 35 (see notes). That's when the priesthood was actually narrowed to only the descendants of Zadok, eliminating the descendants of Abiathar from that point forward. Technically, however, Abiathar's ancestors were to have already been eliminated from serving as priests all the way back to Numbers 25:11-13 (see notes) where it was decreed that priests from that time forward would come only from the line of Aaron's grandson, Phinehas. Not even Eli in I Samuel was a descendant of Phinehas; that prophecy took a long time before fulfillment, but it was fulfilled. 22 Moreover from the possession of the Levites, and from the possession of the city, being in the midst of that which is the prince’s, between the border of Judah and the border of Benjamin, shall be for the prince. There's just not much to add to this passage. Here we see slices of the land allocated to the Tribes of Israel...from one coast to the other. Not much detail is given here. It doesn't say that this city is Jerusalem - could be. The notable aspect of the description is the name given to this city - "The Lord is There." The city will have 12 gates, 3 on each side. These gates will bear the names of the twelve tribes of Israel as specified in verses 31-34. It certainly sounds like Jerusalem.